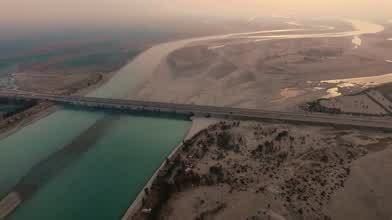 Contributor Imrankw created this aerial view of a spot on the Indus River in the Khyber Pakhtunkhwa region of northern Pakistan. The Indus is one of Asia's most important waterways, comparable in importance to Pakistan as the Ganges is to India. Like the Ganges, it rises in the highlands of Tibet. After running through a portion of northwestern India, the remainder of its almost 3.2k km (just under 2k mi.) course is through Pakistan, where it discharges into the Arabian Sea. Description: Cruising over the landscape near Hund, Khyber Pakhtunkhwa, Pakistan. Hund is the site where Alexander the Great crossed river Indus. There is a Hund museum nearby. Its also the site where Khawazam Shah's army took the last stance against the Mongol invader Changez Khan (aka Genghis Khan).